Running in the rain raises one of the most tricky of questions in life. Is it bad for you? You’re sopping wet, you might be cold. You’re bound to get a cold. Or is it good for you? What’s a little moisture going to do? You sweat anyway! You’ve still exercised, you’re probably feeling pretty damn chuffed with yourself for going out there and battling the elements. I’m inclined to lean towards the latter – why, as long as you dry off properly once you reach shelter, there’s really no harm done. And splashing in the puddles is good for the soul, is it not? 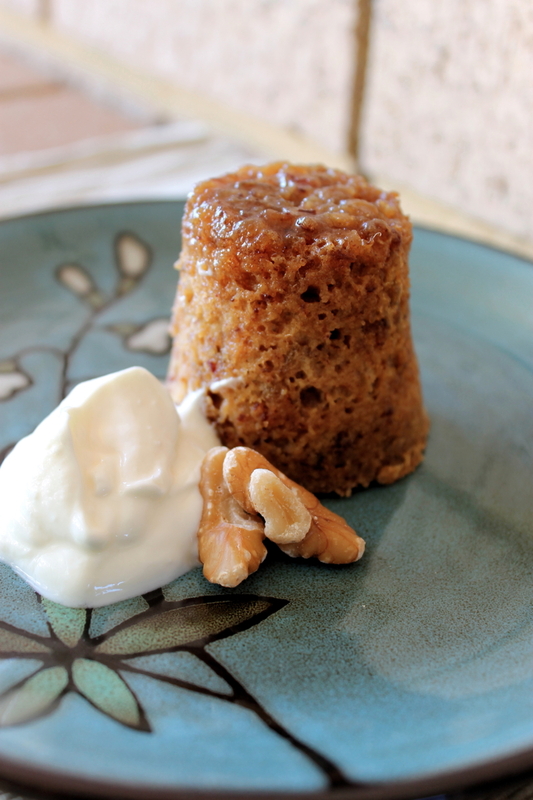 These Date, Walnut and Maple Steamed Puddings put one in a similar conundrum. Are they unhealthy? I mean, they are dessert after all. Or are they healthy, relatively speaking? Preheat the oven to 160C. Lightly grease 4 100ml pudding moulds/dariole moulds. Divide about 1 tbsp of the maple syrup among the moulds, Place the finely chopped dates and the water in a small saucepan and simmer for 5 minutes or until the dates have absorbed almost all the water. Transfer to a bowl and mash with a fork. Add the remaining maple syrup, and vanilla and whisk until well combined. Add the egg yolk and stir until combined. Now stir through the flour and walnuts. In a separate bowl whisk the egg white until soft peaks form. Gently fold the egg white into the date mixture. Scoop the mixture into your prepared moulds and cover with aluminium foil. Place the moulds in another, larger ovenproof dish and fill it with hot water until it comes half-way up the sides of the moulds. Bake for 20 minutes or until the pudding is risen and springs back to the touch. Remove the moulds from the larger ovenproof dish and also remove the aluminium foil. Set on a wire rack to cool slightly before running a knife around the edge of the puddings and gently turning out onto a serving plate or bowl. 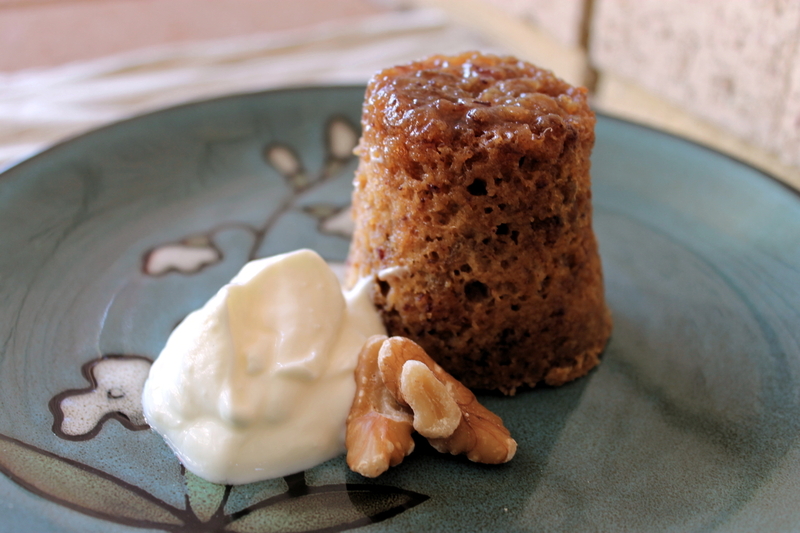 Serve warm with custard, yoghurt or vanilla ice-cream. Will keep for 2 days in the refrigerator. Source: Adapted from BBC Good Food.